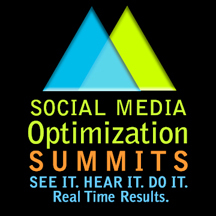 I’m looking forward to participating in next week’s Social Media Optimization Summits in Dallas. One of the features of this conference that stood out to me is hands-on experience for attendees. It will be interesting to see a roomful of attendees with heads down in their laptops and know that they are participating in the discussion, not just checking email and updating their Facebook status. If you have the opportunity to attend and haven’t registered, please click here for a discounted registration courtesy of Mack Collier. With Mack’s VIP referral, registration is only $200! Thanks Mack! Posted on September 7, 2010 July 31, 2012 by Jack MonsonPosted in Digital Marketing and Social MediaTagged Dallas, engage121, Mack Collier, PR Conferences, Social Media Conferences, social media optimization, social media tools.